It would be "unwise" for U.S. President Donald Trump to hold a second summit with North Korean leader Kim Jong Un, unless Pyongyang fully listed its existing nuclear weapons and facilities and agreed on full verification and concrete steps toward denuclearization at the second meeting, experts said. "Given the absolute lack of any progress on actual denuclearization [since the first summit], it would be a very unwise idea to have a second summit with Kim," Robert Manning, a senior fellow at the Atlantic Council, said Tuesday. "I would advise against a second summit, unless Kim provides the [International Atomic Energy Agency] a full inventory of his nuclear weapons program and facilities and agrees to allow the IAEA [to conduct] intrusive … inspections." Trump expressed his interest in having another meeting with Kim, saying in a tweet last week, "I look forward to seeing you soon!" as North Korea began the process of returning remains presumed to be those of American soldiers killed during the Korean War. The two leaders first met on June 12 in Singapore. National security adviser John Bolton on Tuesday said Trump conveyed that he was ready to meet with Kim anytime in a recent letter he sent to Kim. Secretary of State Mike Pompeo and Sung Kim, the current U.S. ambassador to the Philippines who is leading the talks with Pyongyang, delivered Trump's letter to North Korean Foreign Minister Ri Yong Ho during the conference of the Association of Southeast Asian Nations (ASEAN) held in Singapore over the weekend. Douglas Paal, vice president for studies at the Carnegie Endowment for International Peace, said although he would not rule out the possibility of a second summit, he had doubts "about the value of such a meeting," especially given "the very insubstantial activity since the last summit declaration." "The likelihood [of having the second summit and having the second summit be successful] is small, in my opinion," Paal said. Kim agreed to "complete denuclearization of the Korean Peninsula" at the summit with Trump in Singapore, but the concrete steps to be taken toward denuclearization were not set out. Since the first summit, Pyongyang has taken what Ken Gause, director of the International Affairs Group at the Center for Naval Analyses, called reversible and not verifiable steps by dismantling key facilities used to develop engines for ballistic missiles at the Sohae satellite launching station in July. North Korea destroyed the Punggye-ri nuclear test site, also considered a reversible and not verifiable step, in May as a goodwill gesture preceding the summit. 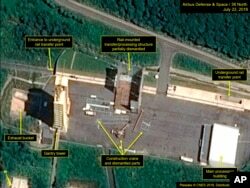 FILE - This July 22, 2018, satellite image released and annotated by 38 North on Monday, July 23, shows what the U.S. research group says is the partial dismantling of the rail-mounted transfer structure, at center, at the Sohae launch site in North Korea. Based on satellite images taken August 3, it appears additional dismantlement is taking place at the Sohae site, according to the U.S.-based North Korea monitoring group 38 North. However, according to a confidential U.N. report submitted to the North Korea sanctions committee on Friday, North Korea is continuing to develop its nuclear and missile program. Pompeo testified that North Korea was still producing fissile material for making nuclear bombs during a Senate Foreign Relations Committee hearing in July. 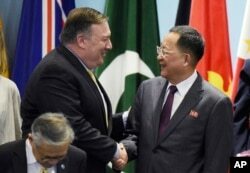 Paal said if Trump were to have a second summit with Kim, "it would have to be a very different kind of summit meeting with much more structured and prearrangement of outcomes," starting with the declaration of North Korea's nuclear weapons and facilities, followed by the verification of the declaration leading to dismantlement. However, Paal is skeptical that North Korea will engage in serious discussions on taking concrete steps toward denuclearization. He said North Korea was "more serious about making small gestures in exchange for relief from the U.N. sanctions." At the ASEAN conference, Ri described the U.S. call for the international community to enforce sanctions on North Korea as "alarming." The U.S. made the move to pressure North Korea to give up its nuclear weapons. But Pyongyang has been demanding that Washington lift sanctions and sign a peace treaty, officially declaring an end to the Korean War, which ended in armistice in 1953. Paal said signing a peace treaty would have to be "embedded in the broader strategy." "Just doing it would be a mistake because you don't want to give them a credit for what they've not done," he added. Gause said that since the North Koreans have "a very strong rationale for deterrence and survival to keep the nuclear program," seeing the U.S. as "their primary adversary and their threat," Washington could test North Korea's rationale and "undermine the rationale" by building "trust and confidence toward some sort of peace regime." "You remove that threat, and their justification goes away," Gause said. "And it becomes harder for them to justify holding on to that nuclear program."